According to the Associated Press, R. Rex Parris, the mayor of Lancaster, CA, home of the California Poppy Festival, wants to brighten up this Mojave Desert city by broadcasting recorded bird songs from loudspeakers on Lancaster Boulevard. The mayor says there’s science to show that listening to birdsong makes people happier. Parris is known for his flamboyant ideas, like getting a law passed giving the city the right to castrate pit bulls, ordering city officials to learn Mandarin to woo Chinese businesses, helping to fund a program to bus the homeless out of town, and saying he was growing Lancaster into a Christian community. Parris is called T. Rex by some of his detractors, but he might be onto something here. Muzak is that background music we also call “elevator music”, – the easy listening music piped into malls, grocery stores, airports, and entertains you while you are holding on the phone for a “representative.” Supposedly this music calms you down, so you relax. Can birdsong be a substitute? Well, therapists have been known to use recordings of birdsongs recorded by a flowing river during their sessions, and a project at a hospital in England found that children were less anxious when the songs were playing. Some believe this birdsong playing may result in less pain and quicker recovery. The hospital has begun piping the birdsongs into the building’s corridors. And scientists speculate that spending 5-10 minutes a day listening to bird songs will help chase the winter blues away. The former chief of Barclay’s Bank was incapacitated by a stroke and was unable to speak, but recovered that ability over a number of months with the help of recorded bird songs. A radio station, ukdigitalradio, also in England, is broadcasting birdsongs 18 hours a day and has become quite popular among city dwellers longing for a taste of the countryside and a challenge to birdwatchers trying to identify the songs. 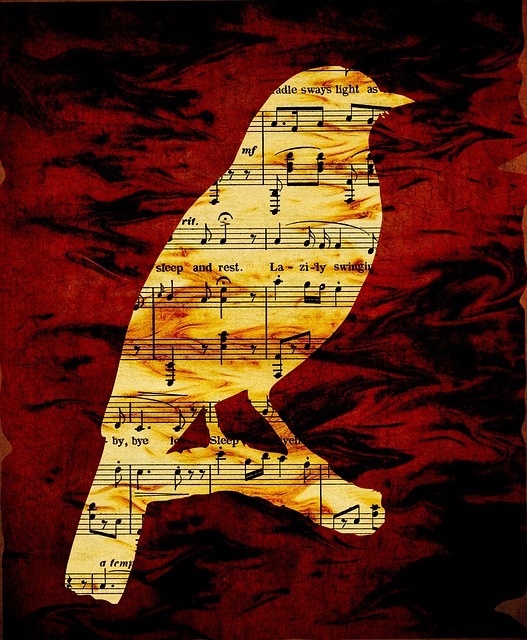 When I was a kid in Chicago in the 1940’s (before TV was common) canaries were broadcast every Sunday afternoon on the Hartz Mountain Radio Canaries show, singing along with an organ or violin. Mostly Strauss waltzes, the show was sponsored by Hartz Mountain products which sold bird seed and bird training records. There are relaxation MP3s and videos of birdsongs that you can watch or listen to while walking, doing yoga, or just sitting or preparing for sleep. I don’t think anyone doubts that the song of many songbirds serve as some sort of relaxation sounds. Wouldn’t you rather hear a titmouse or mockingbird chatter away instead of your neighbors bickering or someone using a chain saw down the block? So you can take a walk through your local park and listen to the songs, or get a CD of bird songs and lie on your sofa. Harvard biologist E.O. Wilson attributes humans’ love of birdsong to our intrinsic “biophilia,” or an inborn need to connect with nature and other living beings. Piping birdsongs onto Lancaster Boulevard may actually have some benefits.